Just testing the picture-taking capability of my new BlackBerry Playbook… not bad; better resolution AND colour than my actual camera. Even with no flash! Making my Auntie Sally’s Challah recipe… as you can see here, each week I print out a new recipe sheet. Terrifically wasteful, but one doesn’t want to bring any kind of electronic device within splashing range. I suppose a whiteboard would do the trick… but for now, I print it off from the spreadsheet, which automatically calculates what I need based on how many finished challahs I want. Another trick that will throw off my quantities a bit but greatly increase the yumminess of the finished product: any bread dough left over from the week – in this case, a bit of a batch of no-knead dough from Tuesday’s boule – becomes an instant pre-ferment for the weekly challah. I did use regular yeast as well, though since I’m leaving it overnight, I probably didn’t have to. One of the most important tools for a food blogger – not that I consider myself to be such, you understand – is a decent camera. I have been reasonably happy with my Sony, but this upgrade adds another dimension of happy that may even see me posting here more frequently. BONUS COOKING TIP OF THE DAY – scroll to the bottom of this post! Mmm… my favourite way to unwind on Friday afternoon, when there’s time, is to sample the yummies for Shabbos and blog about them! 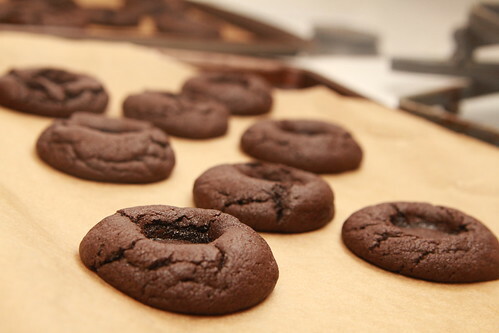 This week, it’s these scrummy chocolate cookies that start out really good but transform into utter decadence with the help of a caramel filling and chocolate coating. They’re not TOO patckedik, either. The actual chocolate cookies came from this recipe from Frugal Ima’s blog (I reduced the vanilla quite a bit), and I baked them last night, because I have had enough bad experiences of baked goods that were not sufficiently cool to ice. This is Frugal Ima’s picture, because I forgot to take one myself. The trick here is pressing down the middle of the cookies RIGHT AWAY when they come out of the oven. Like her, I used the lid of the vanilla bottle to make the indentation. This recipe made a LOT of cookies. Then, this morning, I made this yummy coconut-milk dulce de leche that I fell in love with a few weeks ago. Dulce de leche is basically caramel sauce, and this one features only 3 simple ingredients and a touch of neglect. Perfect for around here! I should have cooked it down a little longer, because mine came out too thin and runny. A little thicker is probably better, though it will probably firm up after a while. The next step is to place the cookies in the freezer for a while to help the caramel set. This step is necessary, I think, even with thicker caramel because you’ll be turning the cookies upside down to coat them and you want everything to stay put. Now for the chocolate coating. Easy peasy: Coconut oil and chocolate chips (and a bit of sea salt)! I used the proportions I found in this Instructable, but found it was too thin, so I had to add more chocolate and it was still too runny. I might use something closer to these proportions in future. HOWEVER, the way I make my life easy when chocolate coating is usually the same… melt the coconut oil FIRST, then add the chocolate and turn OFF the heat. I find that if I avoid having chocolate on the heat at all it behaves wayyyy better. Let the chocolate coating cool for a bit, then retrieve the (frozenish) cookies. Dip one by one; I double dipped for good measure. I noticed that after a few seconds, my caramel sauce was “bubbling up” through the chocolate coating. Here is my desperate attempt to drip chocolate over the little craters that marred the pristine chocolate surface. Just a dot of chocolate on a clean fingertip – drip! Down it goes. Still unsightly, but in a different way. And then back in the freezer to set. When cool, these will probably be fine in the fridge. If I did everything (both caramel & chocolate) PERFECTLY, they’d probably stay solid at room temperature during the winter. But I don’t trust the chocolate coating, so I plan to leave them in the fridge. As with anything chocolatey, I wouldn’t leave them out at all during any season when coconut oil is liquid at room temperature. TIP O’ THE DAY: Freeze any leftover chocolate mixture in a sandwich baggie. Label well so you don’t stand in front of the freezer saying, “is this pareve?” and “when is this from?” Thaw it by floating the baggie in warm water and then snip the tip of the baggie to drizzle chocolate attractively wherever you want it. BONUS TIP: If you don’t want to go to that trouble, call your kids into the kitchen and have them assemble dessert “shish ka bobs” out of mini-marshmallows and banana slices. Drizzle with leftover chocolate mixture and freeze until Shabbos. Tip o’ the Day: (recipe follows) Always preheat your oven to 25-50°F higher than the recipe calls for, then turn it down. You’ll lose 25-30 degrees of heat when you open it and patchke around getting the pan in and out. And most breads (and many pastries) do well with a strong burst of initial heat anyway. Wanted to get a picture of this before it was too late, but… well, it was almost too late. That’s how good this was with our chili tonight! This really is one of the few recipes I’d say would be completely different without a cast-iron skillet. I have made cornbread in pans and it’s lovely… but there is something awesomely crispy about cornbread baked in butter on preheated cast-iron. Given that my soul-food diet precludes bacon, I tell myself that this deep, hearty crunch and this corny cornbread’s crunchy sweet / savoury crust is the next best thing. Or really quite special in its own right, depending on if you’re a glass-half-full or glass-half-empty kind of person. Preheat oven to 450°F. While preheating, melt butter in oven in a 9-inch cast iron skillet (about 5 minutes). When butter is melted (even if oven’s not all the way hot), remove from oven and pour into a bowl to cool slightly. In a measuring cup or small bowl, stir the milk, yogurt (or soured milk), and eggs together well. Stir in slightly cooled melted butter. Mix well. Make a well in the middle of the dry stuff in the large bowl. Pour wet stuff into the well in the dry stuff. Pour in corn kernels now, too. Stir a few times just until moistened. Do not overmix! Carefully remove hot skillet from the oven (hint: use your silicone handle doohickey if you have one!). Pour batter into the skillet - place it in the center of the oven. Reduce oven temperature to 425°F. Bake until centre is firm and a cake tester, skewer or toothpick inserted into the centre comes out clean. For me, this was 25 minutes. Turn out immediately (use the doohickey!) onto a cooling rack. If your pan is well-seasoned and you melted the butter in it ahead of time, it should just fall out with no sticking. Yay for cast iron! If you’re the patient type, allow to cool 10 to 15 minutes before serving. Oh my goodness… I have the most gifted, artistic husband in the whole entire universe. To all my loyal readers, happy birthday from me! Thank you for giving the gift of reading my blogs and (if you haven’t already) Liking my ever-expanding MamaLand Empire!! !